This story was written by CBS News' Scott Conroy. 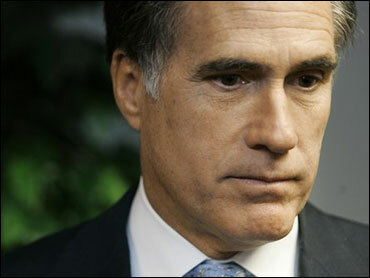 Republican presidential hopeful Mitt Romney is facing questions about religion today. And for once, it's not his own. Speaking to reporters after a health care forum in St. Petersburg, Florida, Romney emphatically disputed a Muslim businessman's account of what transpired at a mid-November fundraising event in Las Vegas. Mansoor Ijaz wrote in a Christian Science Monitor column published today that Romney said he "cannot see that a cabinet position would be justified" for a Muslim in his administration, in light of the percentage of Muslims living in the U.S.
CBS News asked Romney to provide his version of the encounter, which occurred at an event that was closed to media. "His question was, 'did I need to have a Muslim in my cabinet to be able to confront radical jihad and would it be important to have a Muslim in my cabinet,'" said Romney. "And I said, 'No I don't think that you have to have a Muslim in the cabinet to be able to, to take on radical jihad any more than during the Second World War we needed to have a Japanese-American to help us understand the threat that was coming from Japan,' or something of that nature." Romney said that instead of filling his cabinet posts with ethnicity in mind, he would choose his cabinet members based on merit. Asked if that included the possibility of appointing a well-qualified Muslim, Romney said, "I'm open to having people of any faith and ethnic group but they would be selected based on their capacity and their capabilities and the values and skills that they could bring to the administration, but I don't choose people based on checking off a box." "I think his comment is indicative of how he might govern, and I think it's absolutely wrong," said Sen. John McCain, one of Romney's rival's for the GOP presidential nomination, after being told that Romney said he would not appoint a Muslim to his cabinet. "You appoint the most qualified people for the job, no matter who they are, where they came from…to somehow exclude any group of Americans, in my view, is, well, it just is not the way to go." CBS News producer Eric Salzman spoke to Ijaz on the phone today. Ijaz said that Romney's account of the Las Vegas encounter was inaccurate and stood by what he wrote in the Christian Science Monitor. Ijaz said that he assumed the Romney camp would try to contest the account. Ijaz also said that in the past he was a major Democratic fundraiser, but that he has been out of political fundraising since the 1990s. The Romney campaign was quick to highlight to reporters Ijaz's ties to the Democratic Party. "The individual who wrote that column is a Democratic Party fundraiser," Romney's press secretary Eric Fehrnstrom wrote in an email. "This is a person with a partisan political agenda, and it's surprising that the Christian Science Monitor didn't disclose this important fact." The controversy came on a day when Romney spoke about health care to a crowd of about 70 people at All Children's Hospital in Saint Petersburg, Florida. The former Massachusetts governor began his speech by outlining some of the health care-related work he did in his consulting career and said that he has been associated with the issue for some time. Romney touted his Massachusetts health care plan, which requires everyone in the state to have health insurance or face possible penalties, and said that he thinks it would be a great model for other states to emulate. Romney took a reporter's question about Rudy Giuliani's claim that Romney has not stood by his record as governor as an opportunity to reopen the increasingly bitter back-and-forth attacks between the two leading GOP candidates. "I'm very proud of my record and actually as you can probably tell here today, I basically talk about my record everywhere I go," Romney said. "I'm very proud of our health care system that we were able to improve in Massachusetts. I'm proud of the fact that I turned in a $2 billion rainy day fund at the end of my term in office. He turned in a $3 billion budget gap … I think Mayor Giuliani has a fact problem which is meaning that he makes them up."